These photos show the progress since the previous photos were taken three months ago. 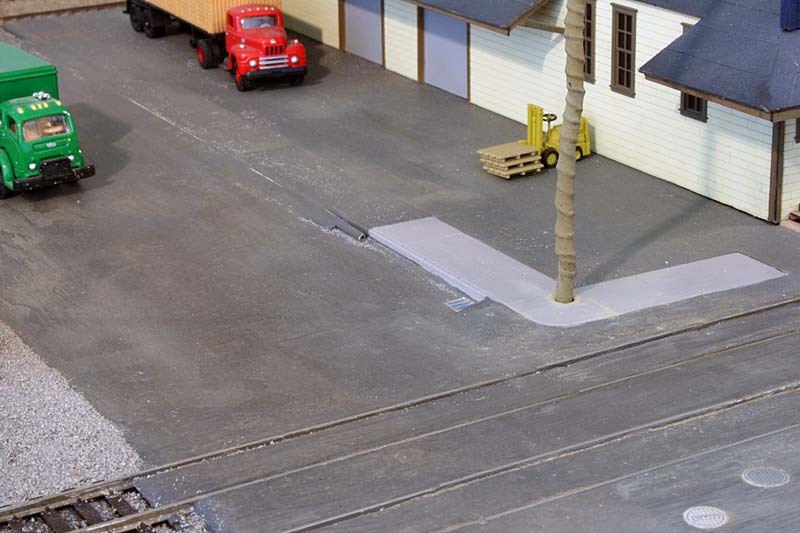 There's still a lot of work to do (like ballasting track) on my condensed version of Riverside, CA. 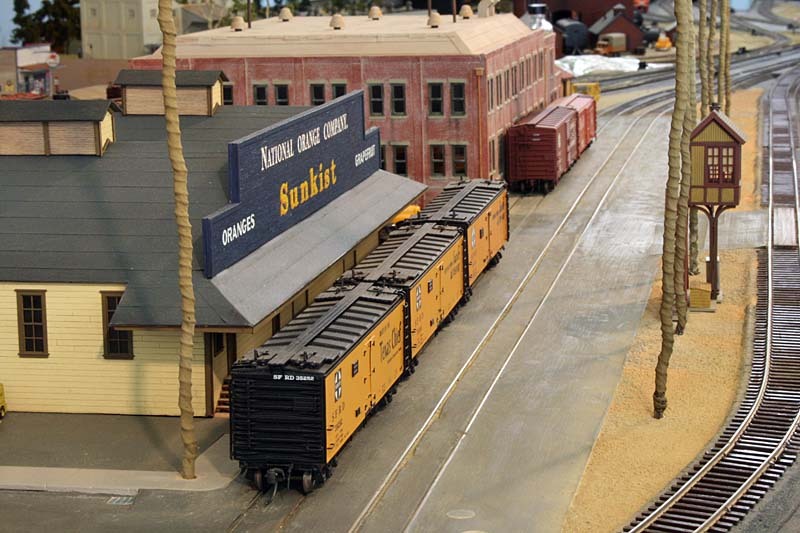 My goal is to have the Riverside scene 100% complete by July 2008, in time for the Santa Fe Railway Historical & Modeling Society convention in Riverside, CA and the NMRA National Convention in Anaheim, CA. 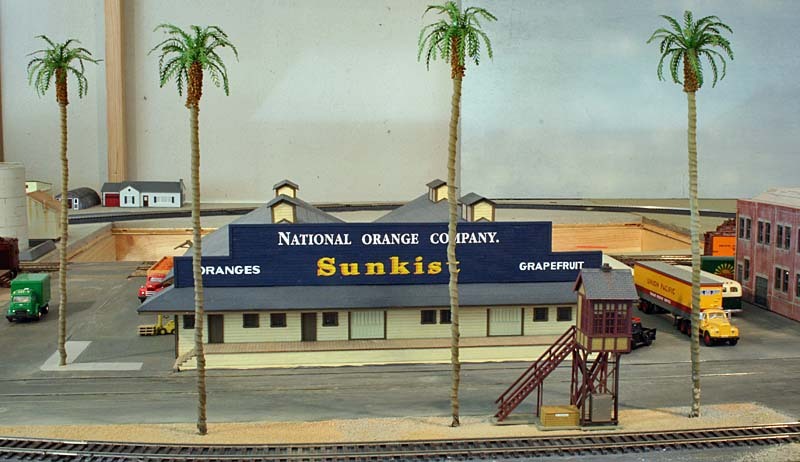 The photos of the National Orange Company packing house on this page can be compared with the prototype photos on the National Orange web page. 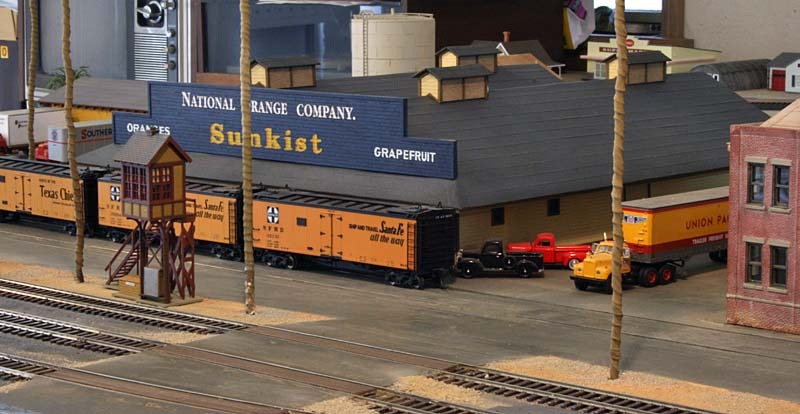 This photo shows the model of the National Orange packing house that has replaced the mock-up that was in this location in earlier photos. The model was built from a YesterYear Models kit by Steve Depelo, owner of The Inside Gateway hobby shop in Bellevue, WA. I purchased it from Steve. I now have an unbuilt YesterYear kit for sale if anyone is interested. Photo date: 12/13/07. 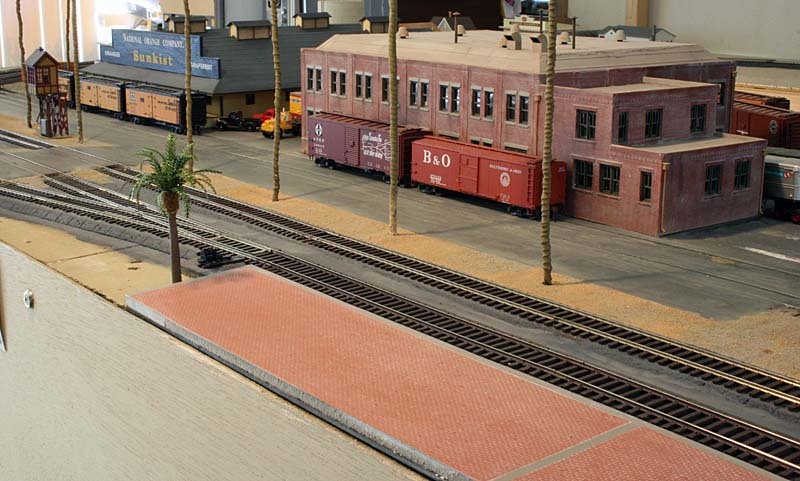 Front view of the packing house showing the tall palm trees (from JTT Models), a signature feature of Riverside. That's Pachappa Avenue in front of the packing house. Photo date: 12/13/07. The north side of the packing house viewed from the northwest. The street is Sixth St. There are still a lot of details to add. Photo date: 12/13/07. Bill Messecar's prototype photos show a pipe running along the curb on Sixth St. The pipe was partially covered with pavement. This close-up view shows my modelled version of the pipe in the pavement. I've also added a drain cover near the corner. Steve Depelo built the base for the packing house and included the concrete sidewalk at the corner, a feature shown in several prototype photos. Photo date: 12/13/07. Close-up view of the juice orange (known as culls) loader at the northeast corner of the packing house. Compare the loader to Bill Messecar's prototype photo. Photo date: 12/13/07. 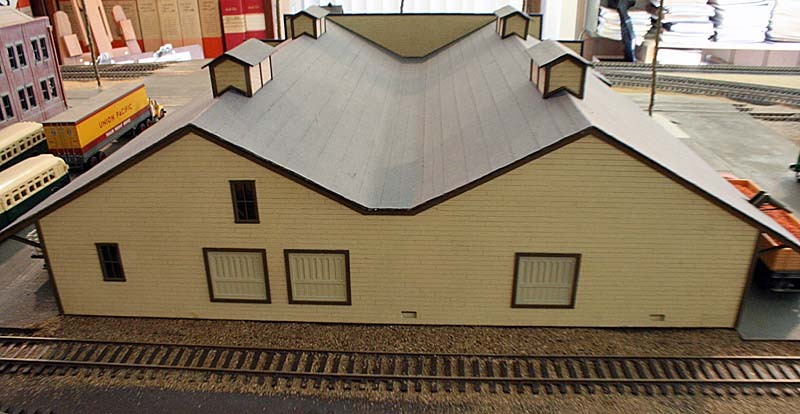 Rear of the packing house with an SP siding. Photo date: 12/13/07. 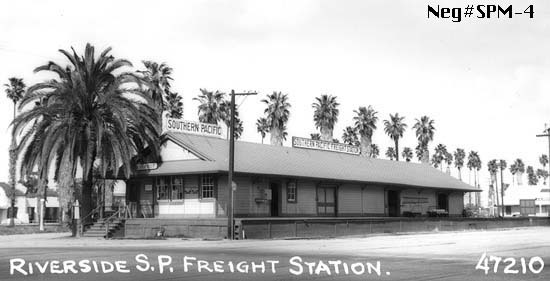 The prototype SP freight house was about a block south of National Orange between Seventh and Eighth Streets. 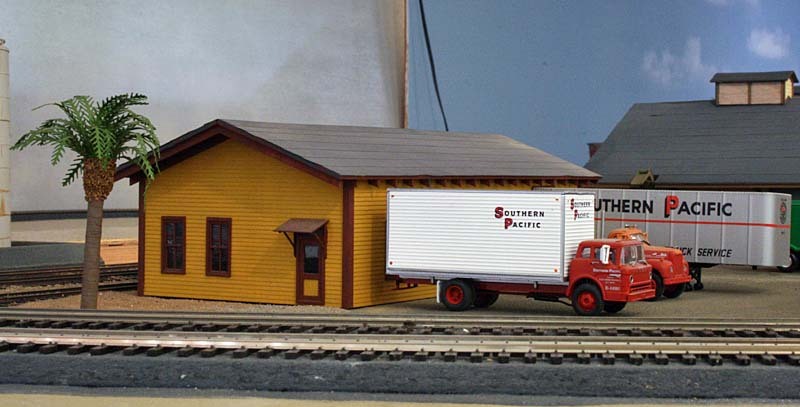 Because of space limitations I placed the freight house just north of Sixth St. Photo date: 12/13/07. Compare this view with Jack Whitmeyer's photo of the prototype. Photo date: 12/13/07. 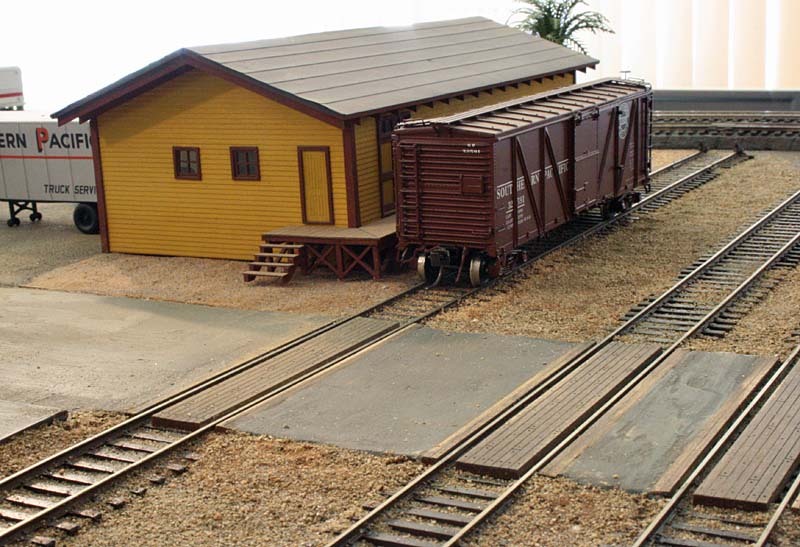 This view shows the back of the freight house. The three tracks belong to the SP. 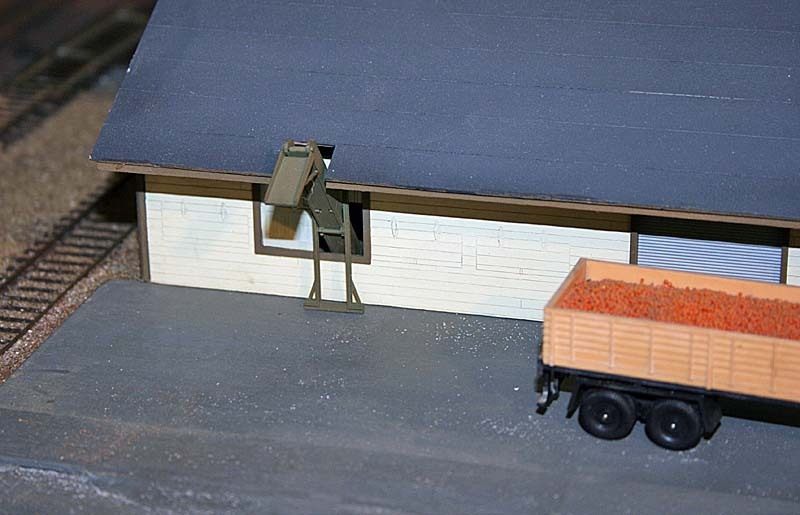 I'm going to add a concrete loading dock between the tracks on the near side of the SP boxcar. 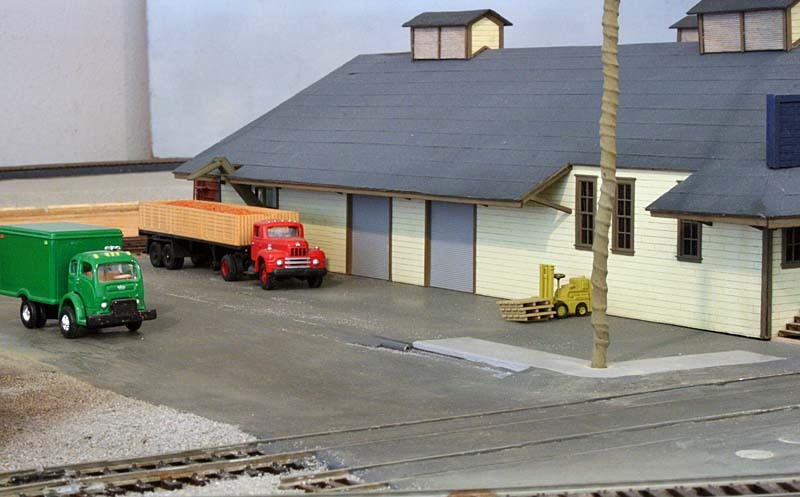 The prototype freight station had a loading dock on the north side. Photo date: 12/13/07. This view looks south along Pachappa Avenue with the Santa Fe tracks in the pavement. The dirt area on the right side of the photo is much narrower than on the prototype, where there were several tracks plus the Riverside Canal. Photo date: 12/13/07. crossing tower was actually at Eighth Street (see the last photo on the linked web page). Photo date: 12/13/07. This view shows the Alfred M. Lewis warehouse with National Orange to the left. 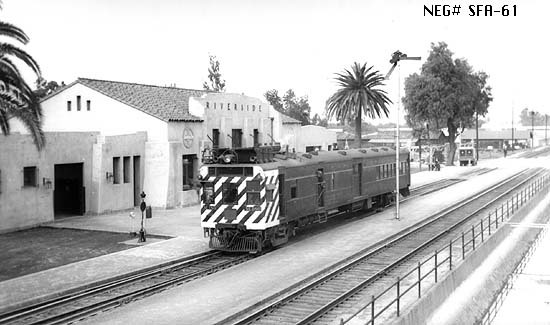 I don't have room for the Santa Fe's Riverside Station but I have included the brick station platform shown in several of Jack Whitmeyer's photos. Photo date: 12/13/07. This is an overall view of my condensed version of Riverside. At the far right are the SP tracks. I apologize for the clutter in the background of the photo. Photo date: 9/13/07.